Join the Major as he trains his soldiers in top secret espionage. Click here to play! If you can help this military man get the troops ready on time, you'll get your hands on his millions! 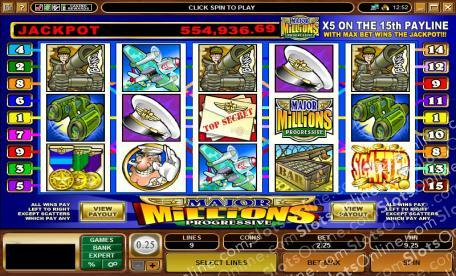 The Major Millions logo is the big winning symbol in this game. Not only will it substitute for most other symbols, but it will also triple your prize if it appears in a winning line. Plus, five of them across the 15th line will win the progressive jackpot! Also helping you in your quest to shape up the troops are the military war ships. Spin three to five of this mighty vessel across an active pay line and you'll bring in up to 800 times your line bet. Three to five fighter planes will get you up to 600 times your line bet. There are also tanks, top secret papers, medals, hats, artillery, and binoculars to help you bring in the big money. The golden scatter symbol is a bonus. If you can spin three to five of them anywhere on the board, you can multiply your total bet up to 50 times. Help the major whip the troops into shape and you'll see yourself taking home a pretty hefty paycheck. The golden scatter symbol will multiply your total bet up to 50 times if you spin three or more anywhere on the board. The Major's Millions logo acts as a wild. It will substitute for all other symbols, excluding scatters, to help you bring in more wins. It will also pay out up to 8000 times your line bet if you spin three to five across an active pay line. Finally, if you spin it five times across line 15, you will win the progressive jackpot.